Megaloblastic anemia is an uncommon problem in childhood that is most frequently associated with vitamin deficiency or gastrointestinal disease. 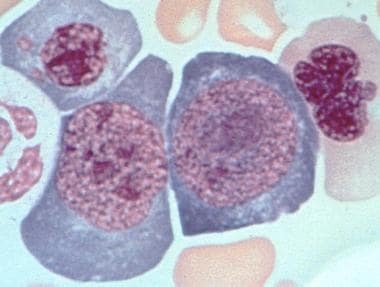 The megaloblastic effect is characterized by an aregenerative macrocytic anemia with nuclear dysmaturity, where the nucleus appears immature relative to the cytoplasm because of impaired DNA synthesis. See image below. Bone marrow aspirate from a patient with untreated pernicious anemia. Megaloblastic maturation of erythroid precursors is shown. Two megaloblasts occupy the center of the slide with a megaloblastic normoblast above. Photo courtesy of Marcel E Conrad, MD. DNA synthesis is impaired in these cases because of inadequate amounts of metabolically active folate derivatives necessary for DNA base synthesis. Megaloblastic changes affect all 3 hematopoietic cell lines. Thrombocytopenia, leukopenia, and anemia are all observed to varying extents. The 2 most common causes of megaloblastic anemia are vitamin B-12 (cobalamin) deficiency and folic acid deficiency. Although their clinical settings differ considerably, no hematologic finding can distinguish between the 2 conditions; specific testing is necessary (see Workup). Other less common causes include the use of metabolic inhibitors such as methotrexate and 6-mercaptopurine and certain rare inborn errors such as thiamine-responsive megaloblastic anemia, [1, 2] Lesch-Nyhan syndrome, and hereditary orotic aciduria (see Etiology). Treatment of megaloblastic anemia depends on the underlying cause. Supplemental folate or vitamin B-12 may be indicated (see Treatment). Go to Pediatric Chronic Anemia, Anemia of Prematurity, Donath-Landsteiner Hemolytic Anemia, Pediatric Acute Anemia, and Fanconi Anemia for complete information on these topics. Vitamin B-12 is commonly ingested with meat or fish. It binds to salivary haptocorrins, which are digested in the stomach, allowing the cobalamin to bind to intrinsic factor (IF). IF is produced by the parietal cells of the stomach. The IF-B12 complex makes its way to the terminal ileum, where it binds to receptors on the enterocyte. It is transported across the cell and enters the circulation bound to a transport molecule, TC II. The B12-TC II complex is absorbed into cells by endocytosis. In the cell, cobalamin acts as a coenzyme in several reactions, including the synthesis of methionine from homocysteine during the reduction of dihydrofolate to tetrahydrofolate and the conversion of methylmalonyl CoA to succinyl CoA. It is the role of vitamin B-12 in the reduction of folic acid derivatives that results in the megaloblastic changes seen clinically. Vitamin B-12 deficiency can be caused by decreased ingestion (eg, poor dietary intake), impaired absorption (eg, failure to release B-12 from protein, IF deficiency, chronic pancreatic disease, competitive parasites, intrinsic intestinal disease), or impaired use (eg, congenital enzyme deficiencies, lack of transcobalamin II, administration of nitrous oxide). Inadequate vitamin B-12 dietary intake is rare in children, though it may be seen in breastfed infants whose mothers are themselves deficient. Pernicious anemia, a common cause of vitamin B-12 deficiency in adults, is rare in childhood. Deficiency of vitamin B-12 activity is usually due to malabsorption or a congenital deficiency of one of the vitamin B-12 carrier proteins. In recent years, vitamin B-12 deficiency has been described in patients with human immunodeficiency virus (HIV) infection, with or without acquired immunodeficiency syndrome (AIDS). In addition to the hematologic manifestations of vitamin B-12 deficiency, abnormalities of the GI tract and nervous system may also be present. The underlying cause of megaloblastic anemia must be determined in each case. Failure to recognize B-12 deficiency, even in the presence of concomitant folate deficiency, may result in permanent neurologic damage. Treatment with folate alone in these cases may reverse anemia but may allow neurologic damage to progress. Folate is ingested in the diet in many different types of food. It enters the enterocyte and is transported into the portal circulation by a carrier molecule. It circulates in the plasma mostly as 5-methyl tetrahydrofolate (THF). It enters the cell via a carrier (methotrexate competes with this carrier). In the cell, folate binds to and acts as a coenzyme with enzymes responsible for single carbon metabolism. Folic acid is available in a wide variety of food groups. Approximately one third of dietary folate is estimated to come from cereals and grains, another third from fruits and vegetables, and another third from meats and fish. Folic acid deficiency is commonly observed in children who are fed a severely restricted diet. This usually occurs with a diet restricted to goat's milk, which is deficient in folic acid. It may also be observed in children with celiac sprue and other malabsorption disorders that affect the proximal small intestine. Deficiency of metabolically active folate metabolites is frequently observed in patients who receive antifolate drugs, such as sulfa antibiotics and methotrexate. A relative deficiency of metabolically active folate metabolites may also be observed in patients who are experiencing increased red cell destruction. These patients require a greater amount of folate than is usually present in the diet and develop macrocytic changes in their erythrocytes. Increased folate intake is also important during pregnancy, in which deficiencies have been associated with neural tube defects. Hematologic testing confirms the presence of megaloblastic anemia and can exclude neoplastic and other disorders. Measure serum vitamin B-12 levels. Methylmalonic acid and total homocysteine levels are sensitive indicators of vitamin B-12 deficiency and correlate with clinical abnormalities and therapeutic response. However, they are not specific to vitamin B-12 deficiency, and care should be taken in interpreting these results. For folate assessment, the red blood cell (RBC) folate level is the best measure of metabolically active folate and includes 5-methyl tetrahydrofolate (THF) in the assay. Serum folate measures the circulating pool of folate but does not accurately reflect the amount of THF present in the tissues. Other tests include serum and urine assessments and the modified Schilling test. Treatment of megaloblastic anemia depends on the underlying cause. Folate deficiency due to dietary deficiency or increased demands is best treated with folate supplements. In addition, a diet rich in green, leafy vegetables is essential for normal intake of folic acid. Folate deficiency caused by the use of sulfa drugs or other antifolate medications may be addressed by folate supplementation or by reducing or eliminating the drug. Folate deficiency due to celiac sprue requires treatment of the underlying disorder and folate supplements. Management of vitamin B-12 deficiency is often more complex, because of the nature of B-12 deficiency in childhood. Data from small trials suggest that oral B-12 supplementation is as effective as parenteral supplementation in patients with nutritional deficiency. Even in patients with intrinsic factor (IF) deficiency, oral supplements may be effective, using higher doses. Often, however, high-dose oral B-12 supplements are unsuccessful in patients with IF deficiency or in those who have undergone intestinal surgery. These patients may require parenteral supplementation because of impaired secretion or absorption of IF. Megaloblastic anemia is caused by various DNA synthesis defects. In folate deficiency, purine biosynthesis is affected because folic acid is essential in this process. Folic acid is essential for purine biosynthesis. Folic acid absorbed from the diet must be activated to produce active tetrahydrofolic acid (THF). THF is necessary for single carbon transfers in the synthesis of pyrimidine nucleotides. Without adequate levels of biologically active THF, the ability to repair and replicate DNA is decreased. Vitamin B-12 is a cofactor for the activation of folic acid in a step that also converts homocysteine to methionine. In the case of inadequate folic acid intake, THF production is depleted, and DNA synthesis is slowed. The effect on hematopoiesis is to reduce the rate of cell production, resulting in pancytopenia. In the cells that are produced, the effect created is an arrest of nuclear maturation. In other words, the cells that are produced have immature nuclei compared with the degree of maturation of the cytoplasm. Increased metabolic demand (eg, chronic hemolysis, such as in sickle cell disease) or increased loss may also result in insufficient folate. Congenital absence or deficiency of carrier proteins can cause vitamin B-12 deficiency. These deficiencies occur most commonly as autosomal recessive enzymopathies. These conditions often manifest during infancy and early childhood and are rare but important causes of megaloblastic anemia. The Imerslund-Grasbeck syndrome of proteinuria and excretion of cobalamin and IF is a rare disorder that arises in early childhood. However, it is an important cause of B-12 deficiency. The prevalence of megaloblastic anemia in childhood has not been established. Vitamin B-12 deficiency is a worldwide problem, however, particularly in the newborn period, due to the combined effects of poor maternal diet and congenital deficiencies of transcobalamin. Pernicious anemia is a common cause of megaloblastic anemia, especially in persons of European or African descent. Dietary vitamin B-12 deficiency is a serious problem in India, Mexico, Central America, South America, and some areas of Africa. The increase in vegetarianism is related to an increase in vitamin B-12 deficiency and is a particular concern in breastfed infants of vitamin B-12–deficient mothers. Megaloblastic anemia is observed in all racial and ethnic groups and in both sexes. It is rarely observed in infants, but may occur in infants who breastfeed from mothers who are themselves deficient in vitamin B-12 or in infants with a congenital deficiency of one of the carrier proteins. Morbidity in megaloblastic anemia may include CNS toxicity, including dementia and loss of dorsal column function. Deficiency of vitamin B-12 is usually at the root of this. CNS dysfunction has been described in adult patients who have deficient vitamin B-12 levels in the absence of anemia. Megaloblastic anemia in pregnancy is associated with persistent learning deficits in children. [7, 8] Hyperpigmentation may also be seen. For the new patient, education should focus on the nature of the deficiency causing the anemia and the underlying factors that produce the deficiency. Educate patients or their parents about the neurologic complications of vitamin B-12 deficiency to ensure that they understand the importance of B-12 replacement. For patient education information, see the Esophagus, Stomach, and Intestine Center; Crohn Disease Center; and Blood and Lymphatic System Center, as well as Celiac Sprue, Crohn Disease, Diet and Nutrition in Crohn Disease, and Anemia. Lorber A, Gazit AZ, Khoury A, Schwartz Y, Mandel H. Cardiac manifestations in thiamine-responsive megaloblastic anemia syndrome. Pediatr Cardiol. 2003 Sep-Oct. 24(5):476-81. [Medline]. Olsen BS, Hahnemann JM, Schwartz M, Østergaard E. Thiamine-responsive megaloblastic anaemia: a cause of syndromic diabetes in childhood. Pediatr Diabetes. 2007 Aug. 8(4):239-41. [Medline]. Baumgartner MR. Vitamin-responsive disorders: cobalamin, folate, biotin, vitamins B1 and E. Handb Clin Neurol. 2013. 113:1799-810. [Medline]. Whitehead VM. Acquired and inherited disorders of cobalamin and folate in children. Br J Haematol. 2006 Jul. 134(2):125-36. [Medline]. Duma A, Cartmill C, Blood J, Sharma A, Kharasch ED, Nagele P. The hematological effects of nitrous oxide anesthesia in pediatric patients. Anesth Analg. 2015 Jun. 120 (6):1325-30. [Medline]. Stredny CM, Frosch O, Singhi S, et al. Vitamin B12 Deficiency Presenting with Neurological Dysfunction in an Adolescent. Pediatr Neurol. 2016 Sep. 62:66-70. [Medline]. Korenke GC, Hunneman DH, Eber S, Hanefeld F. Severe encephalopathy with epilepsy in an infant caused by subclinical maternal pernicious anaemia: case report and review of the literature. Eur J Pediatr. 2004 Apr. 163(4-5):196-201. [Medline]. Molloy AM, Kirke PN, Brody LC, Scott JM, Mills JL. Effects of folate and vitamin B12 deficiencies during pregnancy on fetal, infant, and child development. Food Nutr Bull. 2008 Jun. 29(2 Suppl):S101-11; discussion S112-5. [Medline]. Erkurt MA, Aydogdu I, Dikilitas M, Kuku I, Kaya E, Bayraktar N, et al. Effects of cyanocobalamin on immunity in patients with pernicious anemia. Med Princ Pract. 2008. 17(2):131-5. [Medline]. Pawlak R, Parrott SJ, Raj S, Cullum-Dugan D, Lucus D. How prevalent is vitamin B(12) deficiency among vegetarians?. Nutr Rev. 2013 Feb. 71(2):110-7. [Medline]. Dror DK, Allen LH. Effect of vitamin B12 deficiency on neurodevelopment in infants: current knowledge and possible mechanisms. Nutr Rev. 2008 May. 66(5):250-5. [Medline]. Ozkale M, Sipahi T. Hematologic and Bone Marrow Changes in Children with Protein-Energy Malnutrition. Pediatr Hematol Oncol. 2013 Aug 29. [Medline]. Dugué B, Ismail E, Sequeira F, Thakkar J, Gräsbeck R. Urinary excretion of intrinsic factor and the receptor for its cobalamin complex in Gräsbeck-Imerslund patients: the disease may have subsets. J Pediatr Gastroenterol Nutr. 1999 Aug. 29(2):227-30. [Medline]. Trakadis YJ, Alfares A, Bodamer OA, et al. Update on transcobalamin deficiency: clinical presentation, treatment and outcome. J Inherit Metab Dis. 2014 May. 37 (3):461-73. [Medline].